I once attended a parenting class based off the book Parenting With Love and Logic (for a fantastic list of parenting books, check out this post). Anyway, during the class the presenter mentioned a bedtime routine they implemented at their house that completely ended bedtime drama. I thought it seemed brilliant, but far too simple. Sure enough, I tried it out in my own home and my kids were staying in their bed by day two. Give your kids 3 privileges at bedtime. For the presenter it was: night light, water bottle, and audio book. In our house, it’s: sippy cups, night light, and door open. The first time our kids got out of bed, we simply said, “That’s too bad, now I have to shut your door (or take way the sippy cup,etc.). After they know the routine, you don’t even need to waste your breath, just simply remove the privilege because they know what the guidelines are. The best part about this routine is that you also remove the unnecessary bathroom trips. You know…..all the times that your kid uses the bathroom as an excuse to get out of bed. With this method, they are motivated to take care of those types of things before they get into bed, because it’s not worth getting one of their privileges taken away. 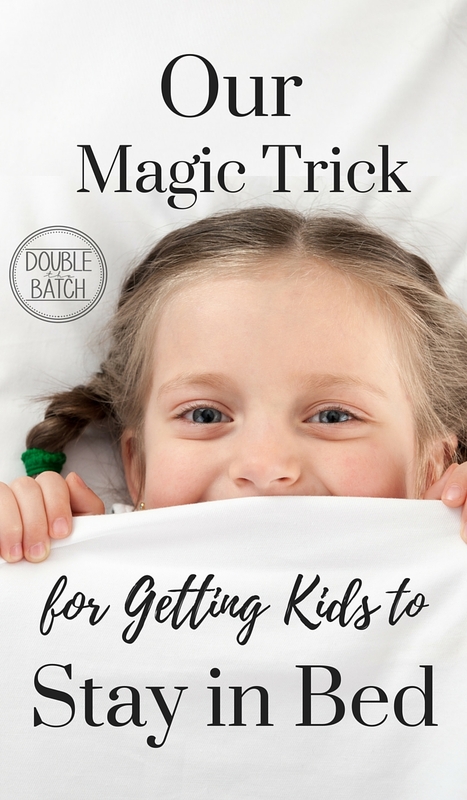 If you give this method a try, your kids might get up to all 3 things taken away, and it can be a heartbreaking night for everyone, but it doesn’t take them long to realize it’s just not worth it to get out of bed (for our kids ages 2 & 4, they understood after the second night). Good luck and let me know how this method works in your home!